On Monday, the California Legislature narrowly voted to extend the state’s landmark cap-and-trade legislation by a decade. The bill, which required a two-thirds supermajority in order to pass, received unusual bipartisan support, with eight Republicans voting with Democrats to approve it. California’s cap-and-trade program, which has been in effect since 2013, requires businesses to buy credits to pay for their greenhouse gas emissions. The goal is to lower emissions to 1990 levels by 2020 — a reduction of about 30 percent — followed by an 80 percent reduction below 1990 levels by 2050. The original legislation only lasted until 2020, but the newly passed bill will extend the program by a decade. The legislature also passed a companion bill to strengthen air quality rules. California Gov. Jerry Brown, left, and Senate President Pro Tem Kevin de Leon urge members of the Senate Environmental Quality Committee to approve a pair of climate change bills on July 13, 2017. On July 17, the California legislature voted to extend the state's cap and trade program. The bill’s passage was a victory for California Gov. Jerry Brown. Following President Donald Trump’s decision to back out of the Paris climate agreements, Brown has emerged as a de facto climate leader, asserting that his state’s commitment to combating climate change is not contingent on the country’s. 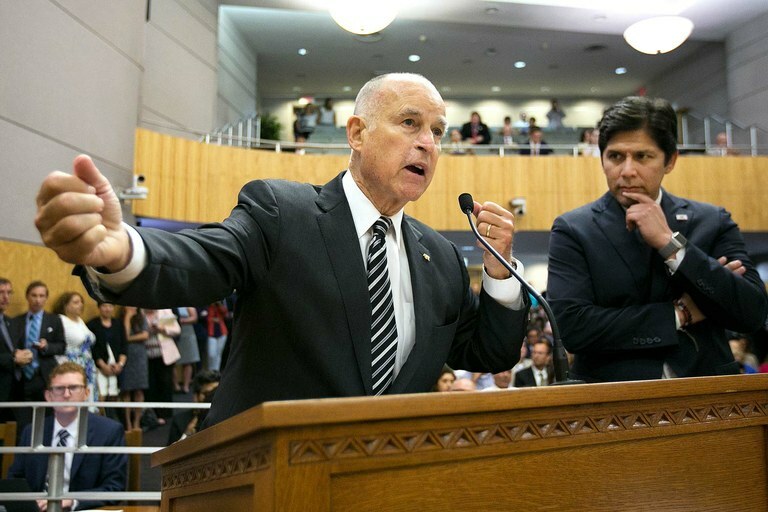 Brown recently announced that California would host its own climate summit next year. This kind of split has stopped climate legislation before. For example, such divisions contributed to the defeat of the proposal for a carbon tax in Washington state last November. Several social justice and environmental groups came out against the tax, which was also opposed by the fossil fuel industry, because they felt it didn’t do enough to help the communities most affected by climate change. California’s cap-and-trade program, the only one in the United States, has been touted as a potential model for other states and beyond. This bipartisan effort to renew it makes it clear that the Republican Party does not represent a united front against climate regulations — and Washington does not speak for state or local representatives. Brown commended the two parties for coming together to support the cap-and-trade extension. “That’s what good government looks like,” he said in a statement following the vote.